For more clarity about what a Sovereign is vs a Sovereign Citizen, please read this essential data. Within legal/lawful system you can not be a Sovereign (self rulership) and Citizen (ruled by another) at the same time. Therefore calling one's self a Sovereign Citizen is a misnomer and the legal system will take this to mean you do not know what your talking about, and are incompetent. There are no magic words which make the insurgent run government go away. One must have complete working knowledge of full breadth of legal frauds, and tread very carefully when dealing with the occupying force in the Continental United States, or elsewhere. And we must unite to end the de facto Cabal rule operating the world over. They’ve lashed out against authority in incidents such as one in 2012, in which a father and son were accused of engaging in a shootout with police in Louisiana, in a confrontation that began with an officer pulling them over for a traffic violation. Two officers were killed and several others wounded in the confrontation. The men were sovereign citizen extremists who claimed police had no authority over them. 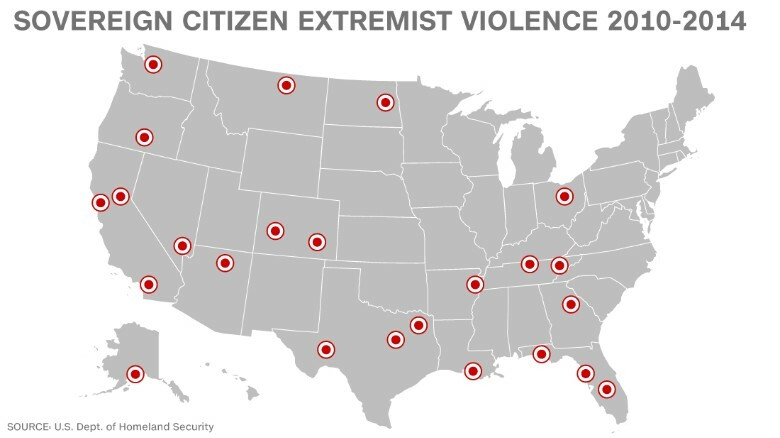 DHS has documented examples of violence by sovereign citizen extremists since 2010. They range from incidents that occurred in the home and at traffic stops to attacks on government buildings. Absent from the White House conference is any focus on the domestic terror threat posed by sovereign citizens, militias and other anti-government terrorists that have carried out multiple attacks in recent years. “I don’t think it’s fair to say the (White House) conference didn’t address this at all,” the official said, adding that President Barack Obama addressed the need to combat “violent ideologies” of all types. An official at the Justice Department, which is leading the administration’s counter-radicalization effort, says many of the tactics aimed at thwarting radical Islamic recruitment of young people can also be used to fight anti-government extremist groups. In 2013, a man who held anti-government views carried out a shooting attack on three Transportation Security Administration employees at Los Angeles International Airport, killing one TSA officer. Last year, a couple killed two police officers and a bystander at a Las Vegas Walmart store. 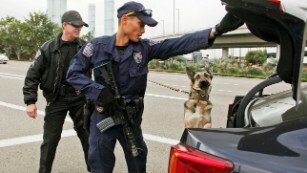 Officers inspect a car outside Los Angeles International Airport in 2013 after three TSA employees were shot. Mark Potok, senior fellow at the Southern Poverty Law Center, said that by some estimates, there are as many as 300,000 people involved in some way with sovereign citizen extremism. Perhaps 100,000 people form a core of the movement, he said. The Homeland Security report’s focus on right-wing terrorists is a subject that garnered political controversy for the Obama administration in the past. 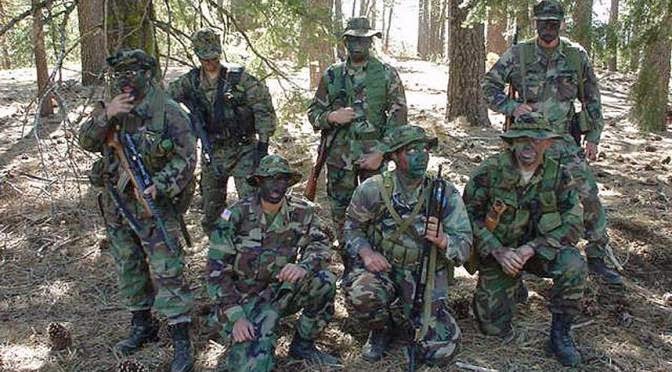 In 2009, a Homeland Security report on possible recruitment of military veterans by right-wing militia groups prompted an outcry from veterans groups. The report was produced by staff members during the Bush administration but wasn’t published until then Homeland Security Janet Napolitano had taken office. Napolitano criticized her own agency for the report. Throwing these freedom groups into the same category as the fanatical mercenary group like ISIS gives the government a pretext to respond without due process but with full military force. These legitimate freedom fighters would then have to deal with a fully equipped adversary that may or may not be willing to fire a single shot unless they belong to the private army now known as the Academi instead of the patriot group, the Oathkeepers. However, the fearmongers continue to spread about foreign troops planning to enter the US for purposes of enforcing Martial Law. Let it may made clear that the US as it is today is already under a fascist regime. If foreign troops do enter the US it would be for the purpose of rounding up the Satanists and setting the people free. The ongoing progressive geopolitical and economic programs that are being implemented can prove that the East is not trying to dominate the world militarily but is only seeking to create a planet of peace, harmony and plenty for everyone. The sovereign groups need to continue their grassroots counter-indoctrination programs and the militia, their recruitment efforts. This war is already in the people’s favor. The fight for freedom must be pursued to its desirable conclusion.